The 80ah battery in our Tischer 230 is not doing the job any more so we're going to replace it prior to some long trips next year. Mr. Tischer is fitting a 92ah battery to his current 230 range. 1. Replace it with another 80ah battery? 2. Replace it with the largest (and highest capacity) battery we can fit in? Any advice on the best makes of battery gratefully received. Fit the largest battery you can get. Definitely don't add a new battery in parallel with an old one - Richard is right - will drag the good one down. I found bog standard leisure batteries only last 3 or 4 years before their capacity is reduced to the point where they won't run my compressor fridge overnight. The problem with regular flooded cell leisure batteries is that they are only specified to cope with a handful of cycles before they die. E.g. you might only get 30 discharges down to 50% of capacity. Some manufacturers state the figure, so may be worth comparing. By the way, the heavier the battery the better - heavier = more lead = thicker plates and more likely to withstand discharge. Obviously the bigger the capacity the less you need to discharge it, assuming you don't go mad and spend all those extra amp hours causing yourself the same problem again. And the less % you discharge it each time the happier and longer lived it will be. Proper deep-cycle batteries are much better - they are what are used in golf carts. But they are much more expensive. Another alternative, and the route I have taken after a number of battery failures over the years, is to switch to an AGM battery. They are also very expensive compared to a flooded cell leisure battery, but depending on the make can be discharged as low as 20% capacity for maybe 500 times before you kill them. They can also be mounted at any angle since there is nothing to spill - I got a 105Ah AGM battery in a space where an 80Ah flooded battery was fitted, but installing it on its end! They also don't produce gas when charging that otherwise needs to be vented. To charge an AGM battery properly you need an intelligent battery charger that is marked as supporting AGM batteries. That also goes for the charging from the alternator to the camper battery - where a DC to DC charger makes a lot of difference. Getting a good quality battery meter makes a huge difference too - one that counts Amp hours, like the Victron. They are expensive too (> £100) but mean you actually know how much you are taking out of your battery and can do something about it before you inadvertently drain your battery too low and damage it. So cheap route is just to be prepared to replace your leisure battery every 3 or 4 years at maybe £80. However, even with standard flooded cell batteries I recommend ensuring you have an intelligent battery charger - ensures the battery is optimally charged and not overcharged. Thanks for your detailed and comprehensive reply Steve. I doubt we'll run to the expense of an AGM +++ so we'll shoehorn in the biggest replacement we can find. Any particular makes stand out for you? Others may have some recommendations about brands. I found that once I'd worked out the largest battery dimensions I could fit and searched for those, there were limited brands available with a decent capacity. The heavier the better if they specify weight. Also look for brands that specify how many discharge cycles to 50% the battery can take. But don't spend a ton on the battery because you have to remember it is essentially disposble (3 or 4 years life). Our Tisher has an AGM from new along with a battery to battery charger with AGM settings. Thanks again Steve. That company looks good and responded quickly to my queries. Lost in the wilds wrote: The 80ah battery in our Tischer 230 is not doing the job any more so we're going to replace it prior to some long trips next year. I'm probably a little late but this might be helpful. Not all batteries are equal. In testing we found outrageous differences between claimed capacities and true performance. We discovered that the claims made by real experts in the field that Deep cycle batteries are the product of engineering and Leisure batteries are the product of marketing departments are totally justified. The cheapest battery we fit to any model in our range costs us more than €300. If we could fit a comparable product for €50 we would. We wouldn't spend 6 times that amount for no reason. We spend the money because that's what's needed to achieve the performance we're looking for. Unfortunately lead is expensive, which is a bugger because that's what you need for best performance. It's so important you can virtually determine which battery will give you the best performance purely by it's weight. This is the only time heavy is good in a demountable though! You get the best performance and longevity from a flooded lead acid battery, not from a GEL or AGM. There are valuable installation and operational advantages to GEL and AGM, especially off-road, but you shouldn't choose them solely for better performance. 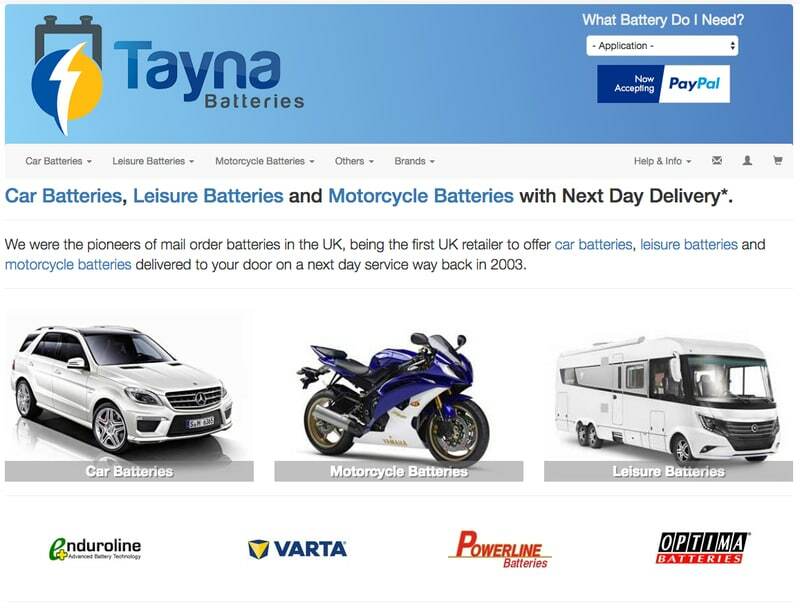 We've recently installed an Enduroline 110 purchased from Tayna. Exactly the same physical size as our old battery so slotted straight in - so far, so good. Tayna were excellent. Thanks again for the advice, especially Steve and Gary.